I had been holding off on actually picking this up and reading it, because I knew that given Carriger’s past performance I really wouldn’t be able to do anything other than finish it once begun. True to form, once I got into it, my husband wasn’t able to get through to me on small issues like “what to eat” until I was done. Luckily, it’s another quick, delicious romp in alternate history Victorian England, where Carriger explains the unlikely political ascendance of that country with it’s openness to vampires, werewolves, ghosts… and Alexia. The very nice thing about this series is that the characters remain true to themselves and develop in logical, though sometimes unexpected ways. I like they way Professor Lyall’s history is peeled back slowly and subtly throughout the course of this book, in complement to Alexia’s own deepening understanding of pack relationships and the way the truly demented can destroy the world around them. In fact, I’ve seen this series described in multiple places as a comedy of manners–and there are some truly slapstick moments where a woman facing immanent accouchement overbalances–but this is not a laugh-out-loud kind of story the way Stephanie Plum’s are. The deeper messages about the nature of soul and the impact of deeply felt emotion on an individual’s character and choices take this story outside the realm of a fluffy puff piece. The supporting cast of characters aside from Professor Lyall, like Felicity, Ivy, and Mme LeFoux, all display new and unique aspects that nonetheless underline their core motivations. And the way the story wraps up the whole ghostly warning thread really warms me to the theme of Alexia’s burgeoning talents in her professional development. I’m very excited to read what Carriger claims is to be the last in the series next year, Timeless. 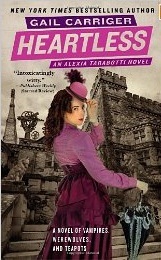 I have no qualms recommending this book on the basis of its smart characters and layered interactions even to those who may not have previously read steampunk, mysteries, or even romances. While it’s easy to mistake this for lighter reading, the themes are meaty and engaging enough to stick with you long after you’ve reshelved the books.